Gingerquilts, summertimerolls, ritapizza, shout4joy, 1boy1girl1kitty2, j_q_adams, simply sandy, sloth003, chinarockfishakem, marmish, and malisha. 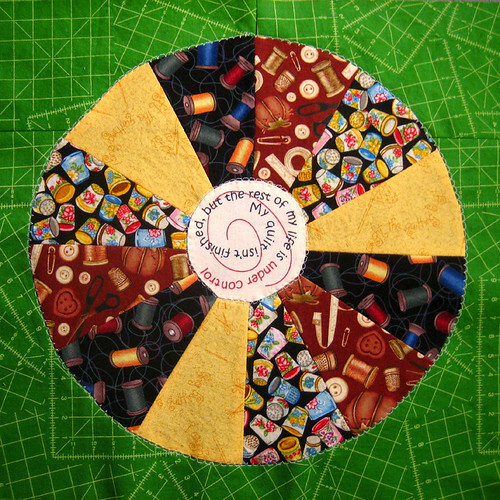 Gingerquilts, ritapizza, shout4joy, sloth003, malisha, marmish. 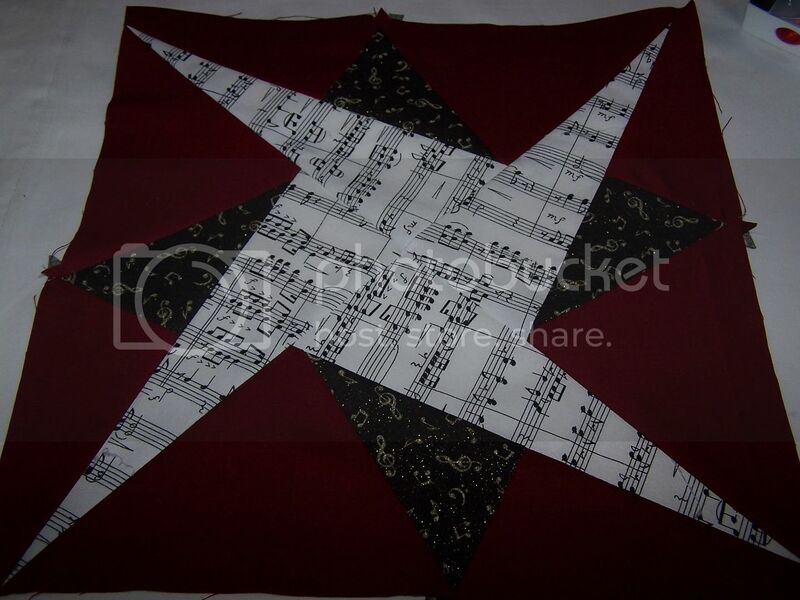 It's from Quilter's Cache and called "Carolyn's Star"
It was hard to get a good picture of this one. It's been dark and raining forever and some of the fabrics got washed out by the flash. 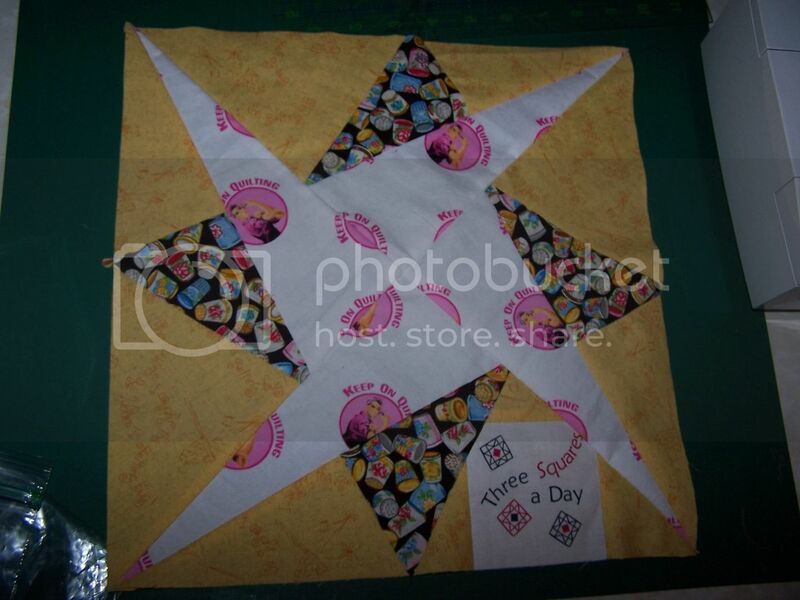 I used the striped fabric for the little star inside the big one. My seam puckered in two places and I couldn't get it out, so I might try and redo those seams before I send it. 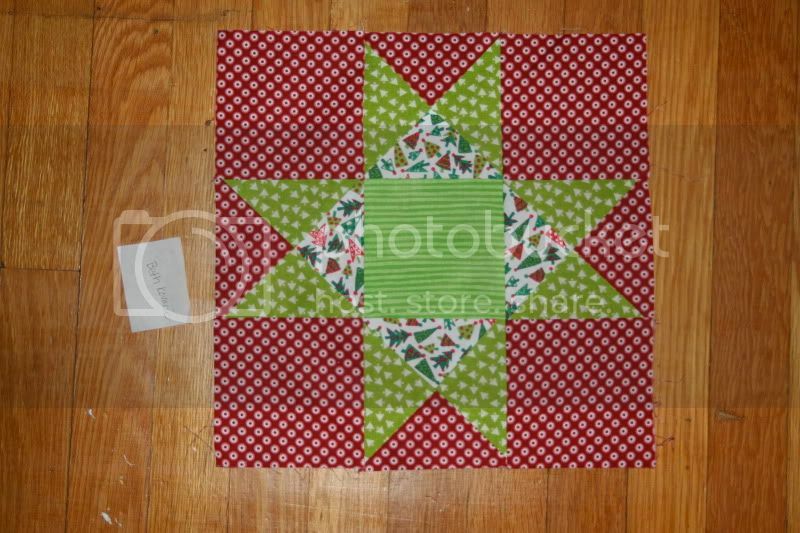 I wanted to use all the fabrics and a log cabin just seemed like the way to make sure they were all seen. Also, I'd forgotten how much fun they can be to make. The one side is just wrinkled, not crooked. I was taking the pictures quick and didn't realize it was wrinkled. 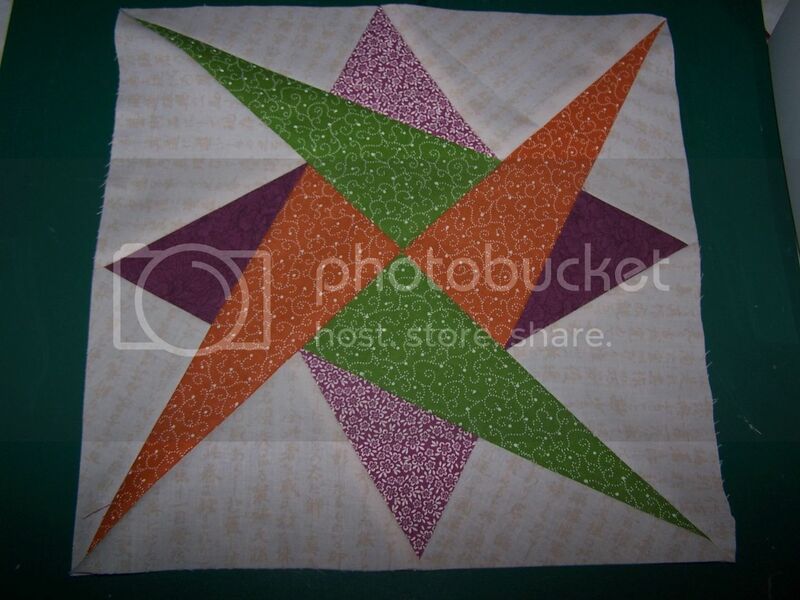 And back to Carolyn's star, this one is sloth003's block. I love the bird fabric a lot. all fabric sent september 30 2009... stupid gouging post office...grrr. and that quote was PERFECT for me! Here are my latest three. I think I'm waiting on one more package of fabric. FIRST- this is more of a confession than an update. I messed up big time on our wonderful organizer's block and went through 1 and a half very VERY unsuccessful blocks. 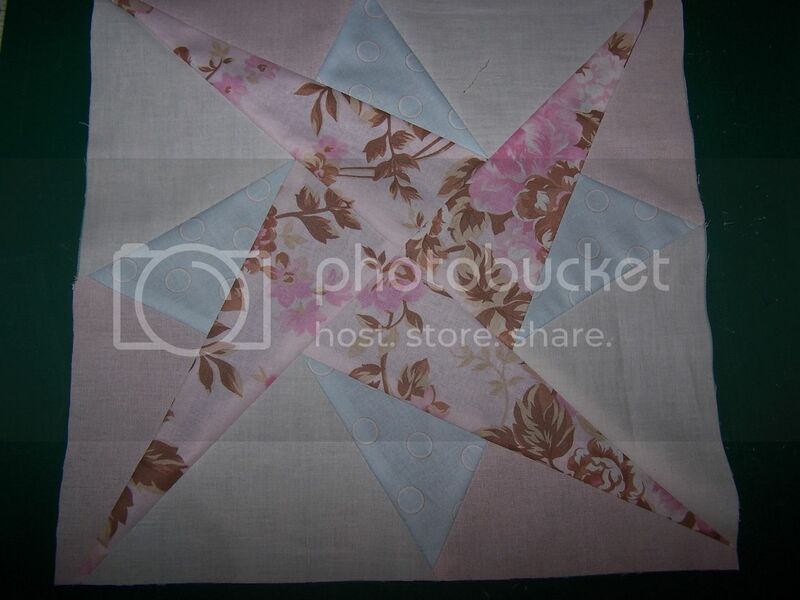 I ended up making a simple nine patch b/c at that time I was running out of fabric and wasn't about to cut one more triangle that my machine was eating the corners of. I'm very sorry. This block technically meets the standards, but I'm not proud of it. 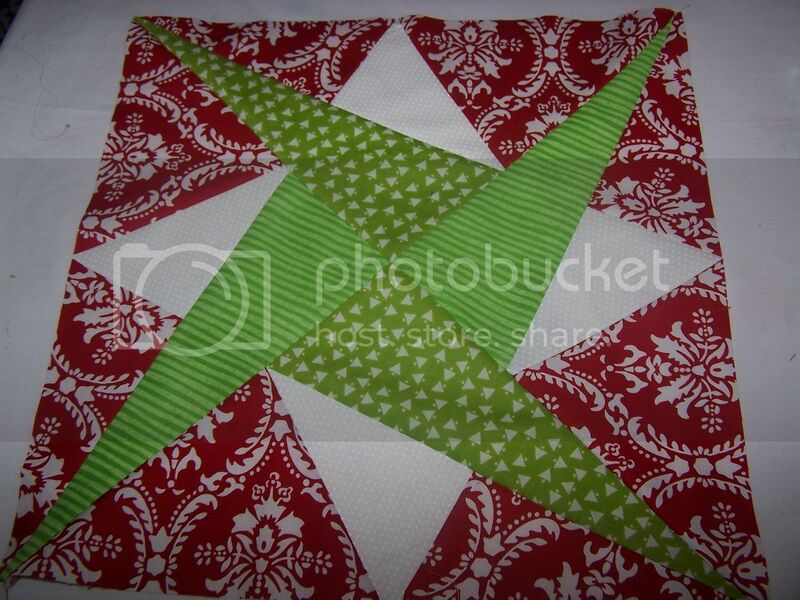 And for Marmish I used 'woven ribbon' pattern. I felt it was Christmas'y'. I like the pattern so much though, it seems more my level, I'm going to make a few more like this one. I've finished Ritapizza's block. My picture is a bit washed out and the pink and white look almost the same-it looks a little better in person. I had a HARD time with this one for some reason. 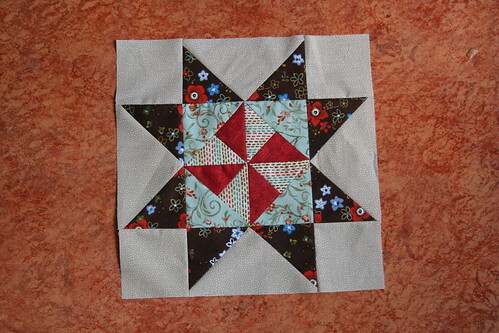 And after my problems with Rita's block I had to go simple with the next one. 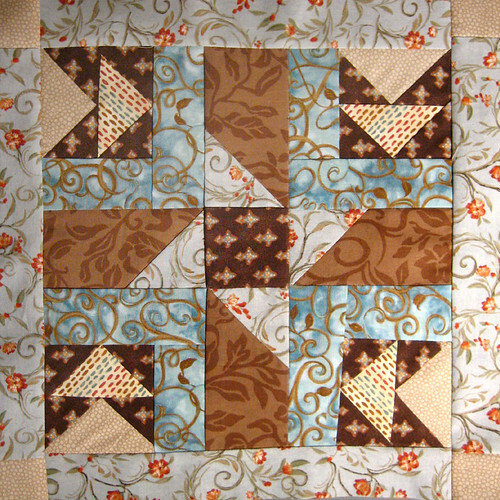 Shout4joys block is called 'chain' on quilterscache.com. I like this one even though it is really simple. 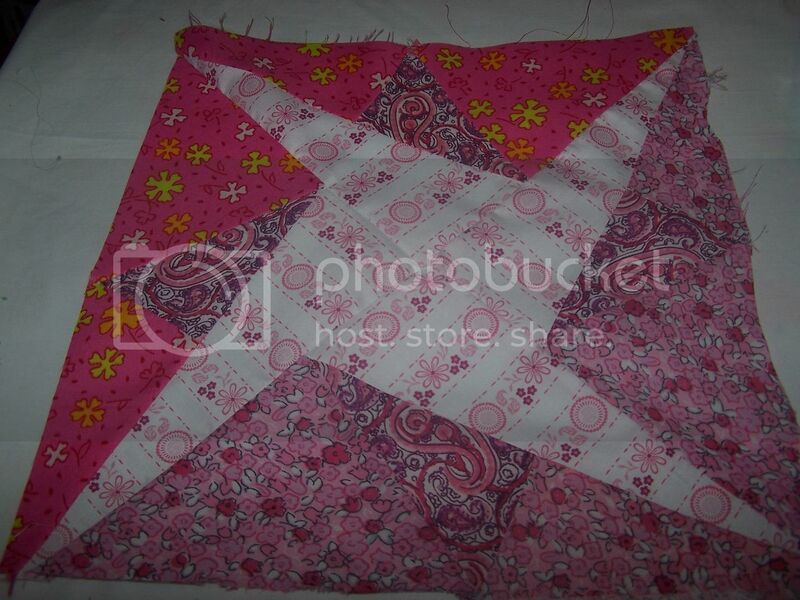 And this is one I tried with my fabric. 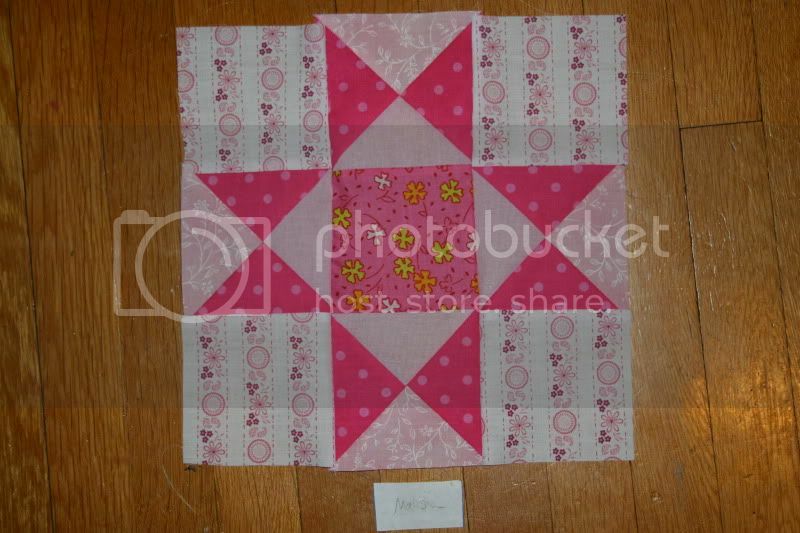 I have a little square that isn't quite straight, that I tried to fix but I don't have a picture of it. 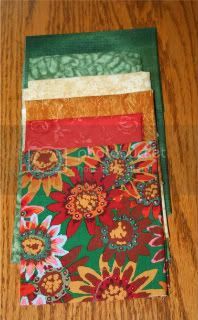 Here is my fabric- I still have to cut it, I'll do that tonight. The final project will go in my family room, which has tan walls with a dark blue accent wall and leather furniture. And we have some red accent pieces in there as well. What do you think? 12/8 Looks like I have received from ritapizza, Linnybelle, sltoh 003, summertimerolls, 1boy1gilr1kitty2, j_q_adams, malisha, gingerquilts, marmish...at least that is what I have right here...I may have more tucked in my project pile in the sewing dungeon. got some more blocks done They won't be mailed until later in the week...maybe I'll have more done by then! These are my fabrics, I know they're too pinky... but afterall I'm a pinky girl (haven't you noticed my picture???) and, those are the colours my bedroom is decorated with! Two points aren't completely perfect but overall I'm happy with it. 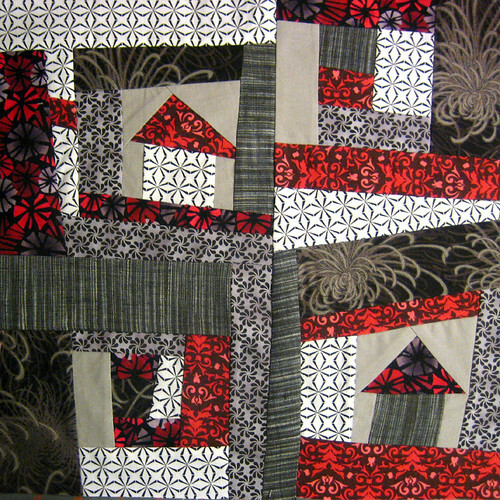 1.06.10 block fo j_q_adams - free pieced log cabins and houses, so fun! 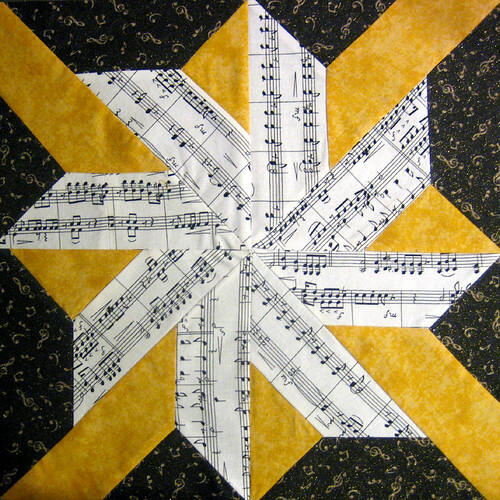 block for Linnybelle - love your music themed fabric! 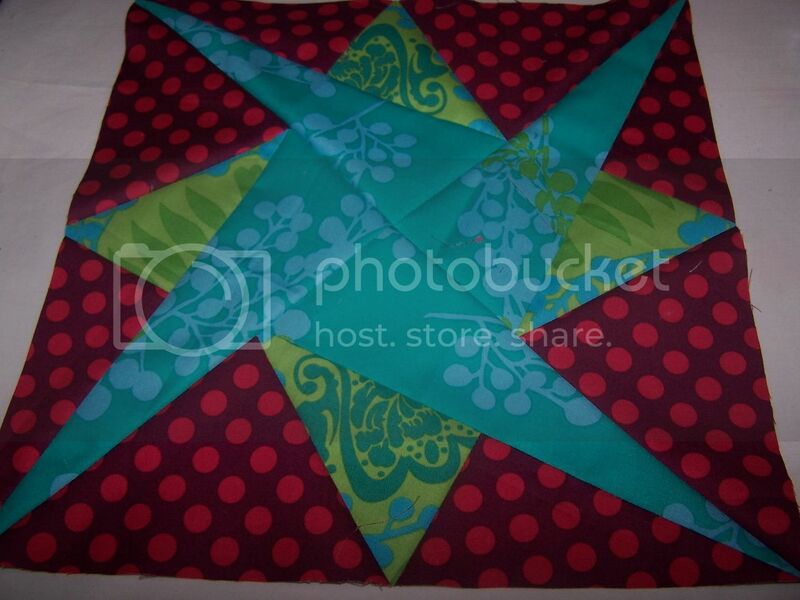 1.07.09 block for SimplySandy - such pretty polka dot fabric! 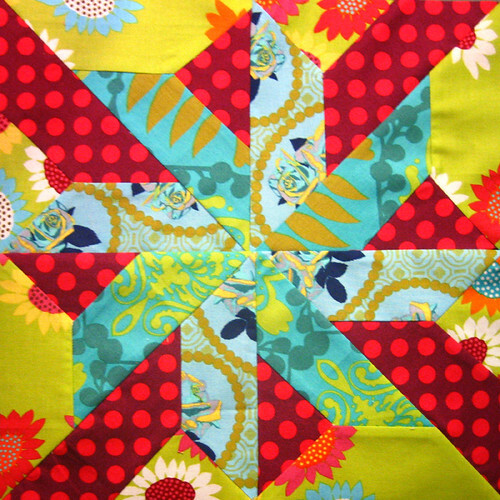 chinarockfishakm - love your bright bold fabrics! 1b1g1k2: fabrics sent (10.2), fabrics rec'd (10.11), sent block back (11.9), received my block! sloth003: fabrics sent (10.2), fabrics rec'd (10.11), sent block back (10.30), received my block! 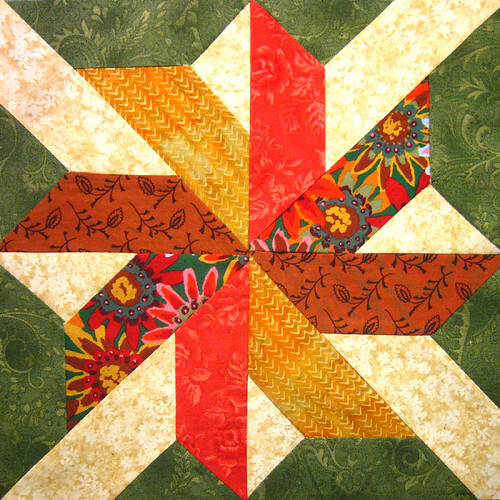 Summertimerolls: fabrics sent (10.2), fabrics rec'd (9.27), sent block back, received my block! 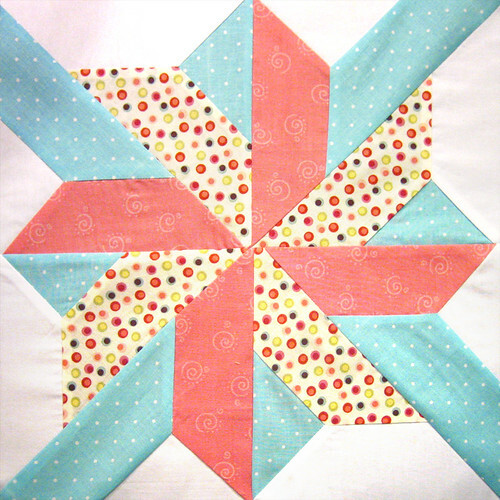 SimplySandy: fabrics sent (10.2), fabrics rec'd (10.11), sent block back (11.9), received my block! 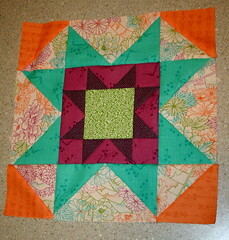 gingerquilts: fabrics sent (10.2), fabrics rec'd (9.27), sent block back (10.30), received my block! 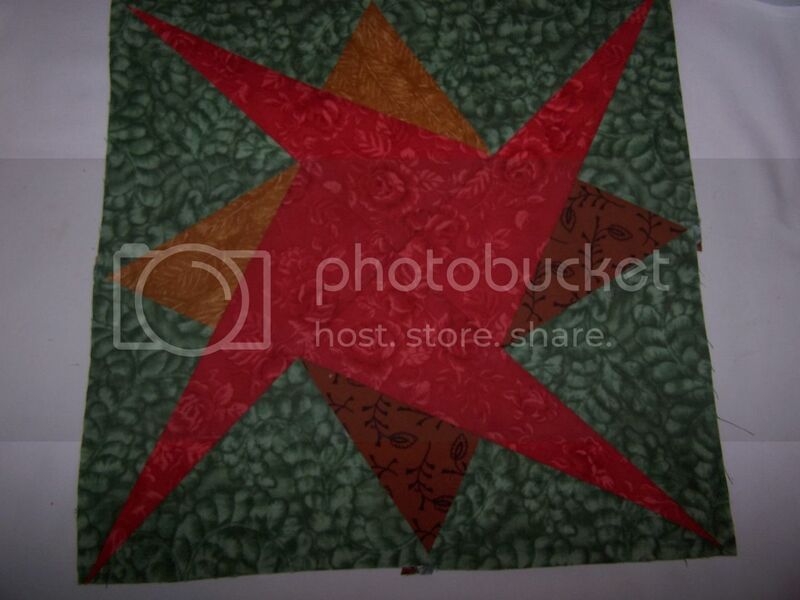 ritapizza: fabrics sent (10.2), fabrics rec'd (9.27), sent block back (10.30), received my block! Marmish: fabrics sent (10.2), fabrics rec'd (10.11), sent block back (11.9), received my block! 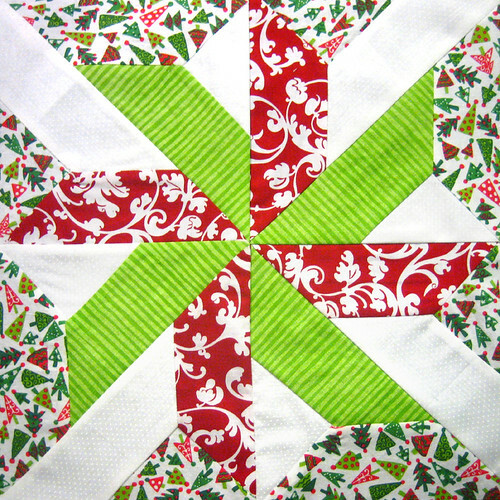 shout4joy: fabrics sent (10.2), fabrics rec'd (9.27), sent block back (11.9), received my block! 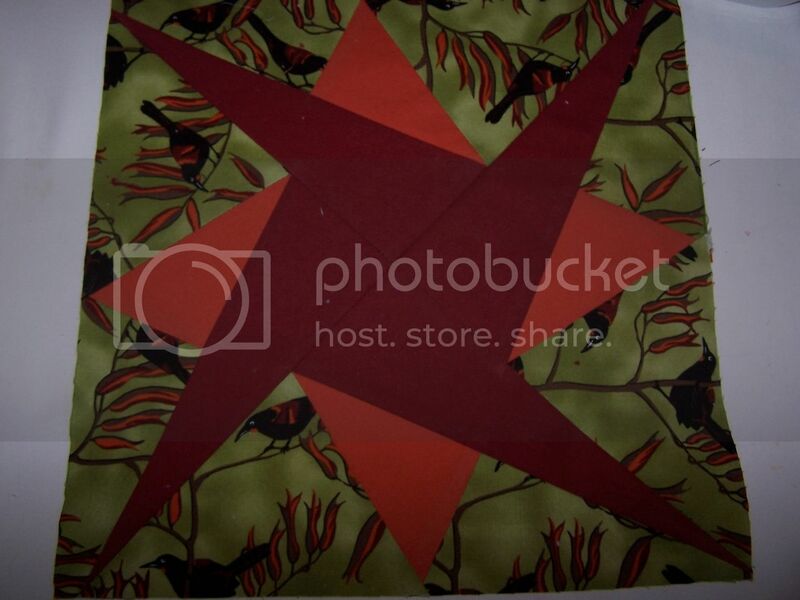 Linnybelle: fabrics sent (10.2), fabrics rec'd (10.11), sent block back, received my block! I was finally able to start working on blocks this weekend! A few more blocks to share today! 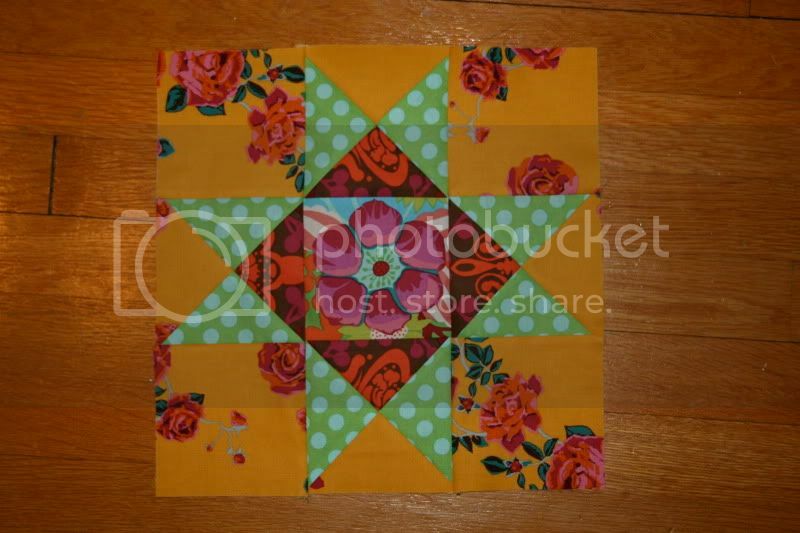 First, a star block for SimplySandy. 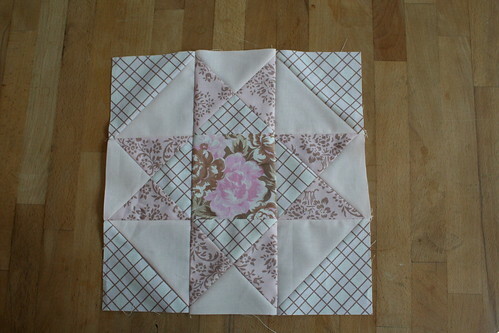 I have to tell you all how proud I am of this block, because it's my first time ever paper piecing!! 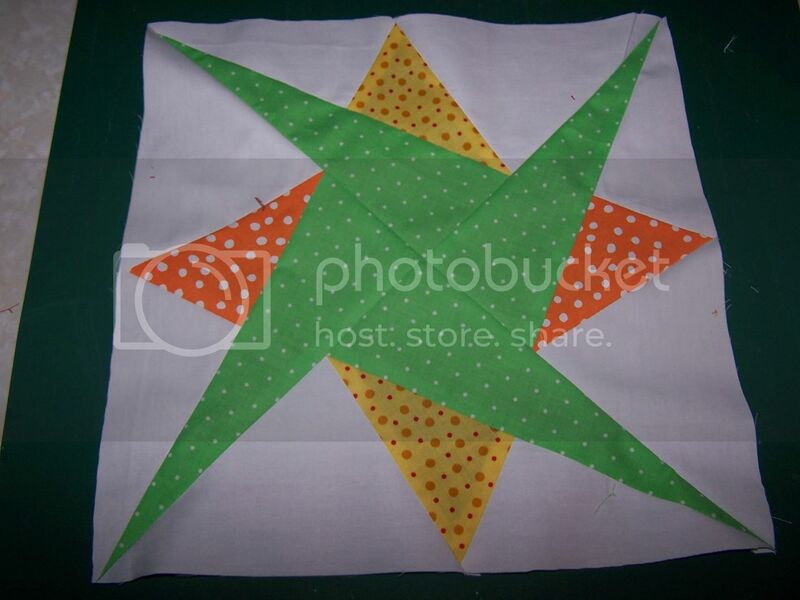 I've been avoiding it for so long, but I was really stuck deciding on a star block to make. 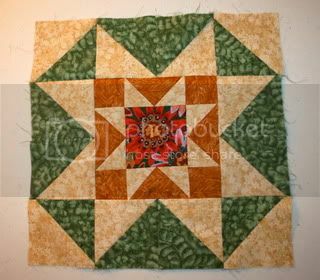 Someone made this one for me in LQS3 and I've always loved it, so I decided this was the weekend to tackle paper piecing. I LOVE how it came out! 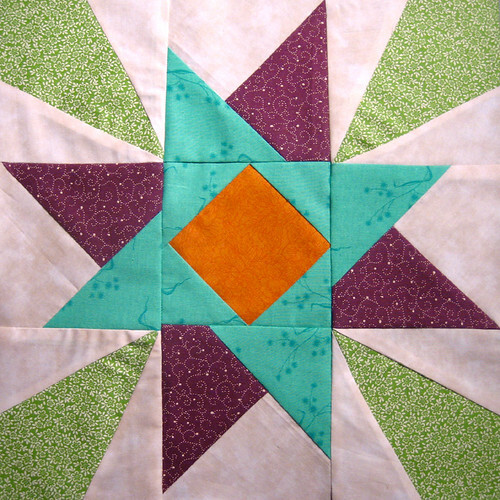 The pattern is String Stars 2 from Quilter's Cache (http://www.quilterscache.com/S/StringStars2Block.html). Next up is chinarockfishakm's block. I am a HUGE, HUGE fan of the Anna Maria Horner fabrics that she sent out, so I wanted to make sure I could highlight them. I decided to make a simple yet effective circle block, using a new curved cutting ruler that I picked up at Joann's. I'm very happy with this one, too. 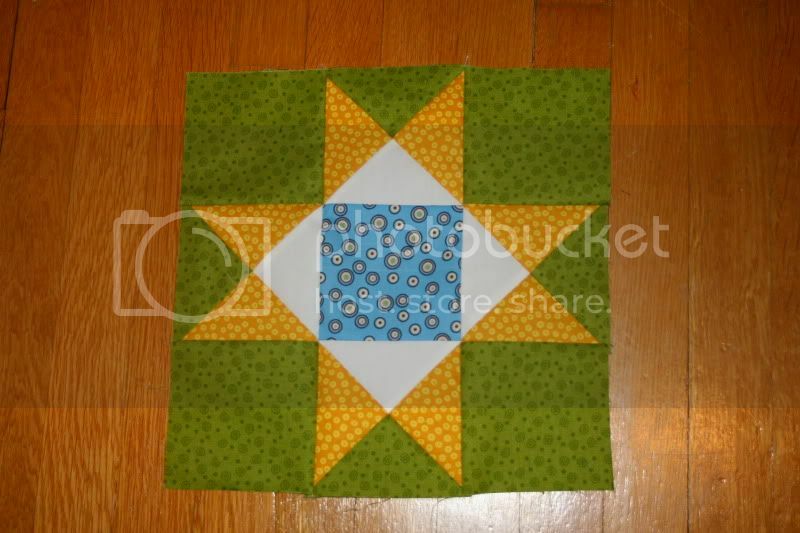 I decided to make another circle block for Shout4Joy. Again, her fabrics and colors are so vibrant that they make a huge statement even with a simple design. Hope you like my block, Joy! This next block is for 1b1g1k2. I knew I wanted to feature her quote square, so I just built the block out from there. No pattern, just made it up as I went along! 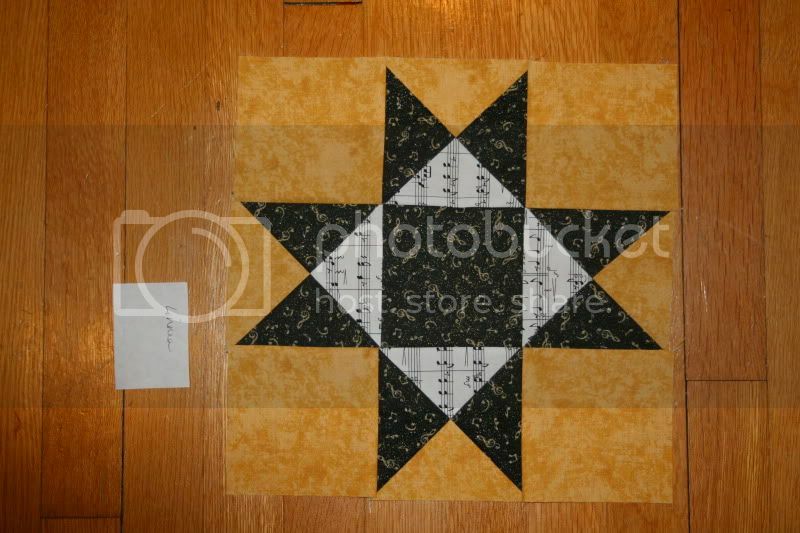 Finally, I attempted another paper pieced block for marmish. 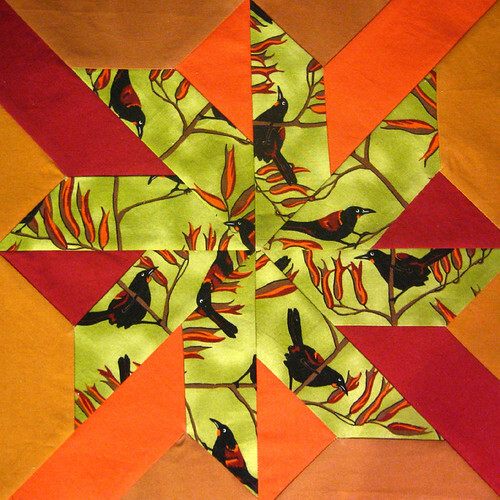 I decided to use the "Circling Geese" pattern on Forest Quilting (a great resource for free patterns, BTW: http://www.forestquilting.com/paperpiecingfree/paperpiecingfree_pg3.html). Unfortunately, I think the design got a little lost because I didn't have enough of the plain white for the middle section, and had to use some of the patterned fabric. I wanted the green geese to suggest a wreath, but I don't think I achieved that. 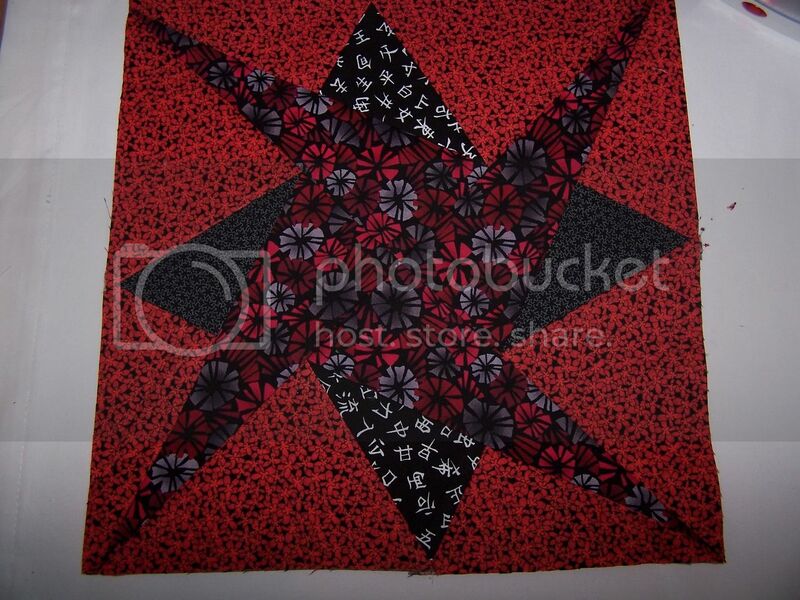 Overall, though, I think (hope) it will look nice in marmish's final quilt. Just a few more to go! whoooo hoooo! glad to join you all this round! This quote was perfect for me, as I love to cook and bake, and dh does the dishes! It was the first ground rule when we moved in together: I'll cook anything he wants if he does the dishes! I finished my first block today. It is for Ritapizza. This one is for Malisha. Sorry the lighting isn't very good. i finally got my top put together. and i love it. it really is rectangular, the wind would not cooperate. and it isn't that glowy, but he sun was streaming thru it. 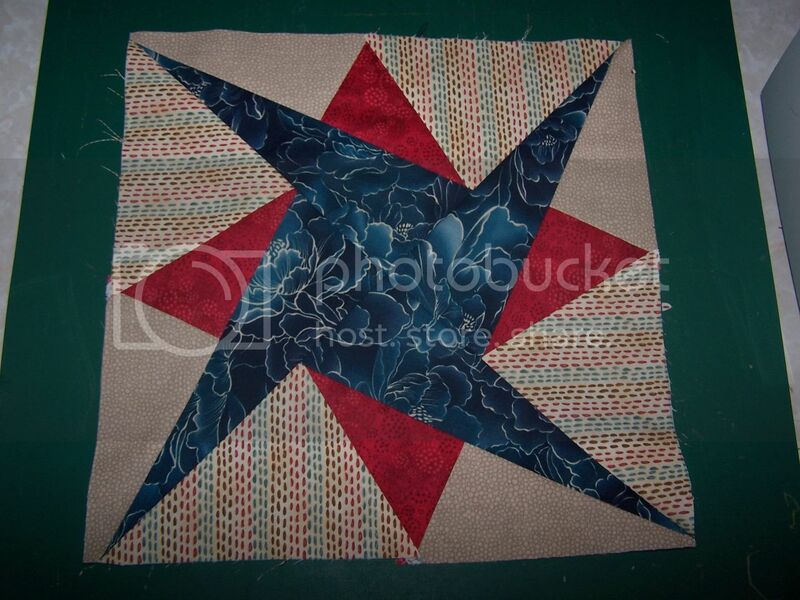 now to finish some of my commission quilts so i can sandwich and quilt this bad boy. 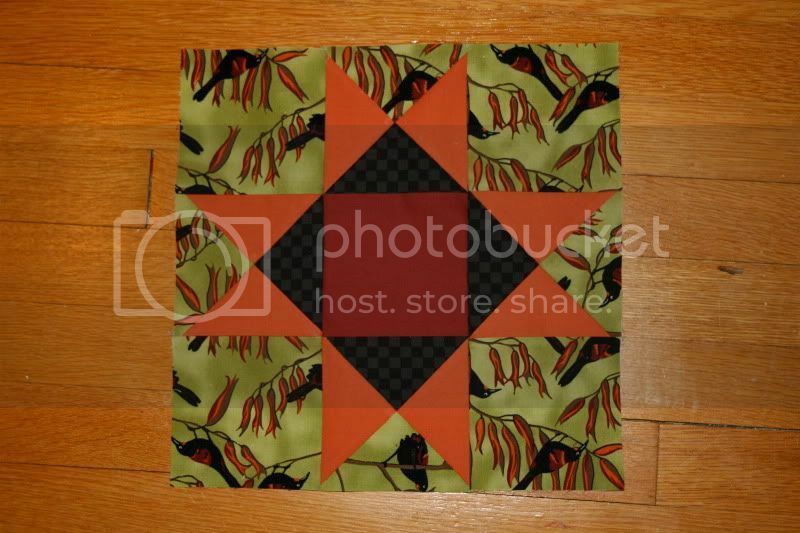 I FINALLY finished this swap quilt at a recent retreat. 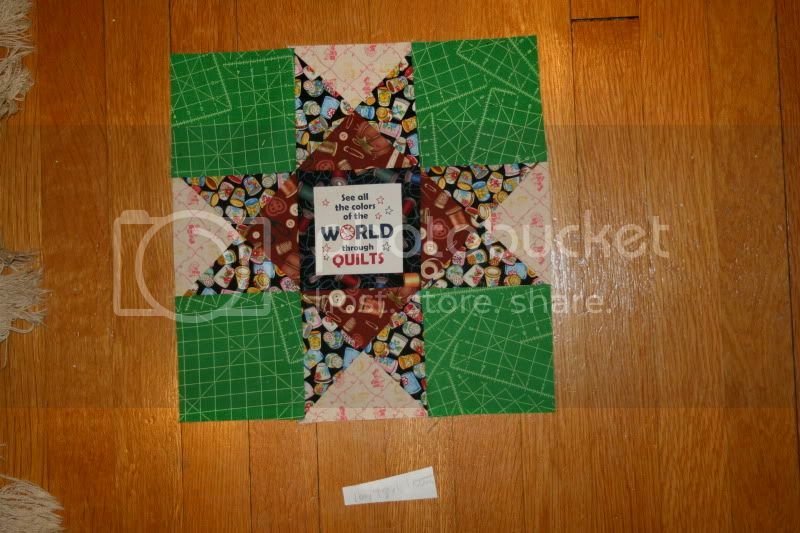 I added some blocks to make it bigger, backed it with minkee, and machine stitched the binding. 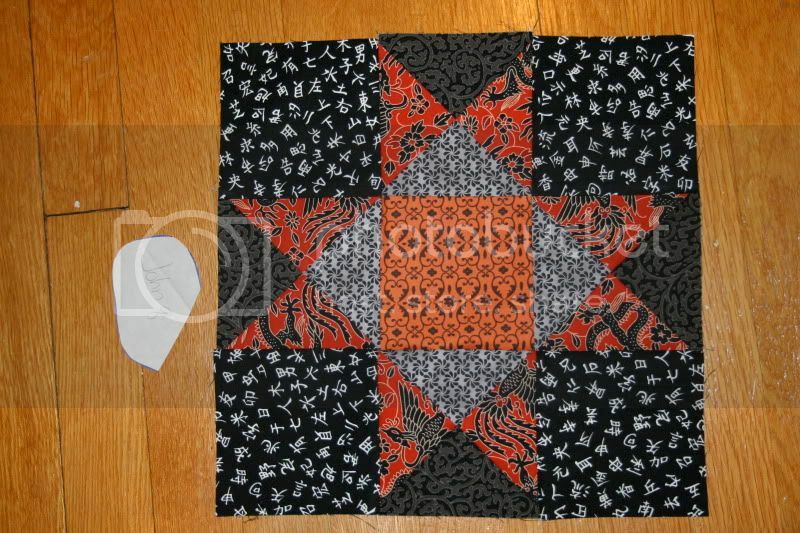 It's FMQ in a loopy pattern.